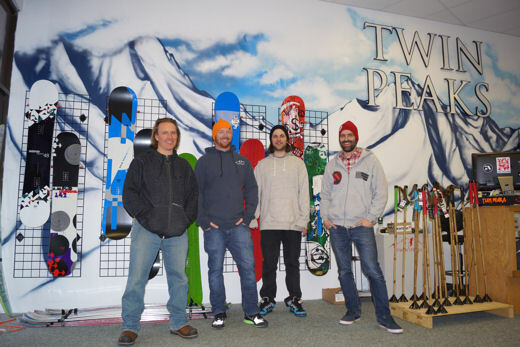 On a recent business trip to the US (if you count the Mt Baker Banked Slalom as business), Amplid co-owner Peter Bauer called by Twin Peaks in Salt Lake City, Utah to get some feedback on the product and go shredding with shop owners Tim and BJ. The following day the Amplid and Twin Peaks crews teamed up at Snowbird to rip some super fresh groomers and poach any pow that was left on the mountain. LTR – Amplid Inner Mountain rep Tai Robinson, Tim from Twin Peaks, US distributor Brandon Pastuka and Amplid owner/founder Peter Bauer. If you want to get your hands on Amplid product in the SLC area or you need the best shred tune in Utah get yourself down to Twin Peaks.